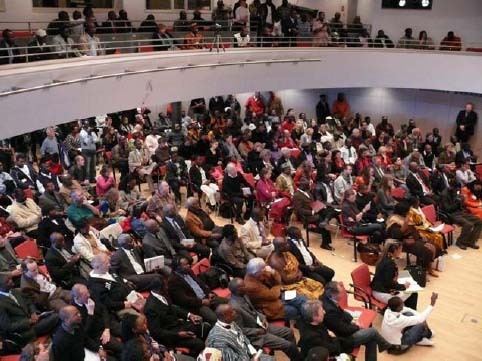 The 3rd Pan-Africanism Congress will take place under the patronage of the Mayor of the City of Munich on 28th and 29th October 2011 at the Goethe-Forum, Dachauer str. 122, in Munich. This year’s congress is dedicated to the memory of Patrice E. Lumumba, the first democratically elected Prime Minister of the then Zaire (now Democratic Republic of Congo), who was killed 50 years ago. His son, Guy Patrice Lumumba, will be attending the congress as the guest of honour.Pan-African organisations, initiatives and friends of Africa, including a representative of the African Union (AU), will be coming together in Munich under the congress theme “Africa’s challenges” for the third time to exchange ideas about feasible ways and means of creating new perspectives for Africa. The Congress will address the following issues: The Pan-African Renaissance; The case of Lumumba and the situation of the Democratic Republic of Congo; Migration and the so-called “Development Cooperation” and The African Diaspora and the AU. Representatives of the global Pan-African movement from Mali, Congo, France, Great Britain, USA, Canada and Germany amongst others, will discuss the question where Africa stands 50 years after its independence. They’ll try to answer the following questions: What have the African countries achieved in the last 50 years? What did not work and why? What are the challenges ahead? The Keynote address “The challenge of rethinking Africa and the prospects of reshaping it” will be given by Dr. Aminata Traoré, social-psychologist, author and former culture & tourism minister of Mali. “If in the 21st Century, children still die of hunger in a continent full of riches and potential, and if on this same continent numerous civilian lives are lost through NATO military operations 'in the name of Democracy', then there is an urgent need to advocate for another Africa,” says Hamado Dipama, from the Pan-African Working Group, Munich. Apart from lectures, the programme also includes workshops and film screenings such as the documentary film on Patrice Lumumba, “Murder in colonial style”, produced by Thomas Giefer who will also be present. The programme will be rounded off with art exhibitions by African artists and a cultural programme with traditional and contemporary African musicians including the Senegalese Political Hip-Hop star Didier Awadi. Admission to the Congress is free.